My corned beef breakfast sammie got its inspiration from the cafeteria where I work. This sandwich is made with corned beef, honey mustard, Swiss cheese, and a fried egg. It is somewhat like McDonald’s Egg McMuffin but served up Irish style. I wished I was more of a morning person. I find it ironic I wake up early, but have zero desire to actually cook breakfast. Five days a week I have breakfast at the cafeteria at work, well actually I have breakfast at my desk. The last week or two they have been serving up corned beef inspired meals. This breakfast sandwich is surprisingly good. It is even better when made at home. How I made this sandwich slightly different than the original I heated my corned beef in the skillet. This allowed the corned beef to brown slightly. I made an over easy egg that had a runny yolk instead of the scrambled egg that they added. I find it hard to beat slightly runny egg yolk. I also toasted the English muffin for a nice little crunch. Do you have left-over corned beef? Enjoy your corned beef for breakfast. Toast the English muffin in your toaster. In a medium-sized skillet add the three to four pieces of thinly sliced corned beef. Heat the corned beef over a medium heat. If your skillet is not a non-stick skillet add about a teaspoon of butter and cook the egg in the melted butter. Season egg with salt and pepper. Flip the slices of corned beef over and add 1 slice of the Swiss cheese to the corned beef in the pan. Spread honey mustard onto the English muffin. 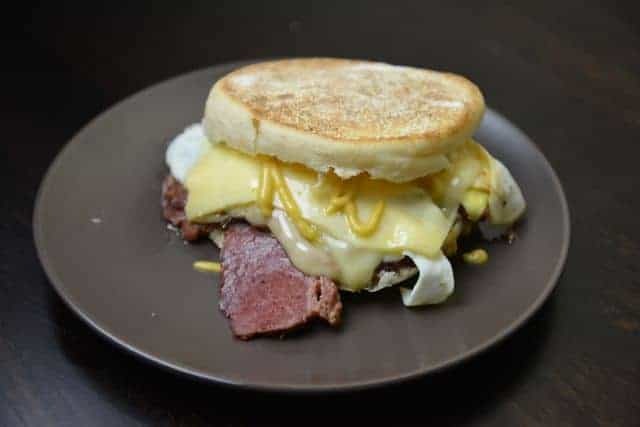 Add corned beef with Swiss cheese to the muffin. Top corned beef with egg, and then add the remaining slice of Swiss cheese on top of the egg. Top with remaining bun. What’s your favorite breakfast sandwich?